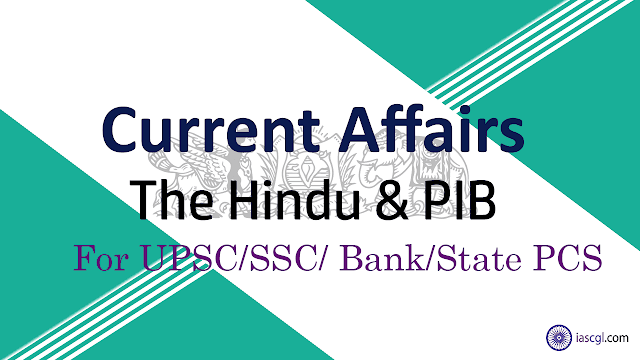 19-20th October 2018, Current Affairs and News Analysis for UPSC Civil Service Examination, SSC CGL and State Civil Service Examinations. 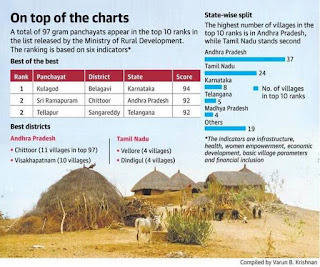 More than a third of the gram panchayats ranked in the top 10 are in Andhra Pradesh, according to the ﬁndings of an ongoing Rural Development Ministry survey. Multiple panchayats made same score in survey and thus they get a tie score. Hence there are total 97 pachayat declared on top 10. Out of these 37 panchayats are in Andhra Pradesh while 24 are in Tamil Nadu. Villages from other States are represented only in single digits. Of the States going to the polls next month, Telengana and Madhya Pradesh have five and four panchayats in the top 10 ranks respectively. A team of oﬃcials surveyed and scored village level facilities and amenities using parameters related to infrastructure, economic development and livelihood, irrigation facilities, health, nutrition and sanitation, women’s empowerment, and ﬁnancial inclusion. Medicinal marijuana has been legal in Canada since 2001, but the new legislation, which breezed through the senate with 52 votes to 29, means that Canadians will be able to buy and consume the drug recreationally from as early as September. The move is a political win for Canadian Prime Minister Justin Trudeau, who vowed to legalise cannabis in his 2015 election campaign. That pledge was aimed at taking proﬁts away from organised crime and regulating the production, distribution and consumption of a product that millions of Canadians had been consuming illegally. Zika, a flavivirus spread mainly by mosquitoes, belongs to the same genus as dengue and chikungunya. Some evidence that Zika has been in India for long comes from a 1954 survey, which found several Indians with Zika antibodies. However, this evidence wasn’t conclusive, because other ﬂaviviruses, like dengue, can also trigger Zikaneutralising antibodies. The ﬁrst conﬁrmed Indian case occurred in 2016 in Gujarat. In Rajasthan, Zika is causing fever, rash, muscle and joint pain. But the French Polynesian and Brazilian outbreaks were linked to deadlier conditions such as microcephaly, in which the child of a Zikainfected mother is born with an abnormally small head. In rare cases, patients also developed GuillainBarre syndrome, which causes potentially fatal muscle weakness. Indian oﬃcials are watching out for these complications, since the Rajasthan strain is closely related to the Brazilian strain. If Zika has been in India since 2016, why is there a large outbreak only now? First, Rajasthan’s residents may not have been exposed to Zika before, and thus lack immunity. American studies show that if 50-60% of a population is exposed to the virus, herd immunity develops and transmission stops. Another possibility is that mutations in the Rajasthan strain are helping it spread. More research is needed to identify such mutations. The third explanation is that even though Zika has been around, it is being detected only now because we are looking. Until 2016, when Zika was declared a WHO global health emergency, India wasn’t testing for Zika. Not much, unless you are pregnant. Zika is usually shortlived. Pregnant women should be tested and should avoid travel to outbreak areas. Infection can be prevented through mosquito fogging and not allowing water to stagnate. There is no vaccine yet, but many vaccines are in trials, including one from Bharat Biotech. The new air quality monitoring station at Chandni Chowk, which measures the concentration of Particulate Matter (PM) 1, has thrown up worrying results. According to the data collected by the Ministry of Earth Science’s System of Air Quality and Weather Forecasting and Research (SAFAR), the concentration of the particle, which is under 1 micron in size, touched 54.32 micrograms per cubic metre on October 16. This was the highest this season so far. There are no national or international acceptable standards for PM1 concentration in the air, unlike those for PM2.5 and PM10. But studies across the world have indicated a link between the pollutant and cardio-vascular disease. Currently, PM1 is considered part of PM 2.5 pollutant, but after building adequate infrastructure to measure the concentration of bigger particles, the Centre and the state have started to build equipment to measure smaller particles as well. Delhi has close to 40 air quality monitoring stations, all of which measure the concentration of PM 2.5 and PM 10 along with that of gases like ozone, nitrogen dioxide and carbon monoxide. The SAFAR station at Chandni Chowk is the only one measuring PM1, trends show that PM 1 is a significant part of the PM 2.5 that is being measured at most other stations. India’s wealth has trended upward strongly since the turn of the century, although there was a setback in 2008 due to the global financial crisis and currency fluctuations. Globally, Switzerland remains the richest nation in the world in terms of wealth per adult, followed by Australia, with Singapore ranking ninth among major economies. India created a whopping 7,300 more millionaires during the 12 months to mid-2018, taking the total number of dollar-millionaires to 343,000, who are collectively worth around $6 trillion. However, the wealth per adult stayed flat at $ 7,020 (around Rs 515,970) as against $47,810 in China (Rs 35.14 lakh). Annual growth of wealth per adult averaged 8 per cent over 2000–18. While wealth has been rising in India, not everyone has shared in this growth. The country has 404,000 adults in the top one per cent of global wealth holders, which is a 0.8 per cent share. According to Credit Suisse Wealth report, personal wealth in India is dominated by property and other real assets, which make up 91 per cent of estimated household assets. Over the 12 months, non-financial assets grew by 4.3 per cent, accounting for all of the wealth growth in India. House-price movements are a proxy for the non-financial component of household assets, which reached a high of 9 per cent for India, it said. Data localization: why, why not? News: Earlier this week, companies around the world scrambled to try and meet a RBI-mandated deadline to store Indian users’ financial data in India, reigniting conversation about “data localisation”. The recurring data localisation agenda has bubbled up in a number of government directives or drafts. In early April, the RBI issued a circular mandating that payment data be stored only in India by October 15. This covered everyone from Mastercard and Visa to WhatsApp Payments and PayTM. In late July, a data protection draft law by a committee headed by retired Justice B N Srikrishna recommended that all personal data of Indians have at least one copy in India. A subset of that data, labelled critical personal data, must be stored and processed only in India. A draft report of a cloud computing policy recommended localisation of Indians’ data. Cloud computing, a service offered by the likes of Amazon and Microsoft, allows customers’ data to be stored on remote data centres. Security agencies, domestic born technology companies like PayTM, Reliance Jio, etc. companies whose rivals are giants from US, etc. are supporting the data localisation. A common argument of government officials is that localisation will help Indian law enforcement access data. The April RBI circular stated that “to ensure better monitoring, it is important to have unfettered supervisory access to data stored with these system providers”. When a spate of lynchings across the country was linked to WhatsApp rumours, WhatsApp’s firm stance on encrypted content frustrated government officials. In addition, proponents highlight security against foreign attacks and surveillance, which opponents consider a weak argument in cases of data mirroring. Concerns also rose when Facebook declared that its Cambridge Analytica controversy had affected Indian users as well. Tech companies especially condemn the large tax differences between international companies operating in India and those with a permanent establishment in the country. “Data is the new oil” also provides a backbone to much of the localisation drive. In the home of the largest open Internet market in the world, companies like PhonePe claim that national wealth creation relies on in-house data storage. The think tank European Centre for International Political Economy has found a surge in data localisation measures worldwide over the last decade. Russia has the most restrictive regulation for data flow with strict localisation and high penalties. The European Union’s General Data Protection Regulation (GDPR) does not mandate all data to be localised, but rather restricts flow to countries with a strong data protection framework. The United States leaves regulation up to the state and sector. Earlier this year, President signed the Clarifying Lawful Overseas Use of Data Act (CLOUD Act) which established data sharing with certain countries. The Indian data localisation wave is the latest digital battleground of ongoing power wars between government and industry. There is a need to strike a balance between national security, economic interests and individual rights. Council of Scientific and Industrial Research ,Indian Institute of Toxicology Research (CSIR-IITR), Lucknow has developed an innovative technology for “Drinking Water Disinfection System” with Trade name “OneerTM”. This system provides continuous treatment of water and destroys disease-causing bacteria, viruses, fungus, protozoa, cyst etc. in order to ensure safe and safe drinking water for domestic and community drinking water (by BIS, WHO etc.) in accordance with national and international standards Can be made available. This technology will prove to be very helpful especially for the rural people because it can be powered by solar energy. It has been developed under the 'Make in India' mission. Indian Institute of Toxicology Research, Lucknow was established in 1965. It is the laboratory laboratory of the Scientific and Industrial Research Council. IITR conducts research in key areas of toxicology. These include the impact of industrial and environmental chemicals on human health and the ecosystem and research related to pollutants in air, water and soil. Evaluate the safety of the chemicals used in industry, agriculture and daily life. Determine the action method of toxic chemicals / pollutants. Suggestion of remedial / preventive measures to protect health and environment from pollutants. Identify the health hazards caused by risks in chemical industries, mines, agricultural areas and the environment. Seamless / prompt clinical examination of disorders caused by various chemicals. Collection, storage and dissemination of information of toxic chemicals. Develop human resources to deal with industrial and environmental issues. To make available platforms to the public and entrepreneurs to discuss issues and concerns regarding chemicals, additives and safety / toxicity of products. Should there be two time zones in India? India is a vast country that extends from east to Bangladesh border to the Arabian Sea, but despite the vast geographical area, we have a single time zone here. There has been debate among various citizens and politicians over the years that there should be two separate time zones in India or not. On the one hand, it is demanded by the North-Eastern states to increase their time of two to two and a half hours. On the other hand, it is opposed, and in the context of opposition, it is argued that with the formation of a different time zone, some practical difficulties can emerge. At present, two time zones have been proposed by the National Physics Laboratory, which determine the official standard time in India. The National Physics Laboratory has published a research paper in relation to the need for two time zones in India, this research proposes a new time zone which is one hour ahead of the current time zone. This article, published in Current Science, has once again winded the demand for separate time zone debate. This research explains how the time zone of two time zones can be set individually. The research paper issued by the National Physics Laboratory requires two time zones IST-1 (UTC + 5.30 h) and IST-2 (UTC + 6.30 h). Proposed line of demarcation 89052'E is a narrow border line between Assam and West Bengal. States located in the west of this line will continue to follow Indian standard time ie IST-1. Assam-Meghalaya, Nagaland, Arunachal Pradesh, Manipur, Mizoram, Tripura, Andaman and Nicobar islands-IST-2 will follow the states located in the east of the line. Researchers estimate that on the basis of the sources mentioned in the article, 20 million kW of energy will be saved annually. To make this idea of the National Physics Laboratory a new laboratory will be required in the new time zone. Each country has a standard time which is measured based on differences in latitude and longitude. The official Indian standard time in India has been determined by keeping the Allahabad of Uttar Pradesh at the center, which is determined by National Physics Laboratory, Delhi. Kanyakumari from Kashmir and from Arunachal to Gujarat, India has the same time zone valid. This arrangement was made in the year 1906. Although the official time of Kolkata was dictated separately by 1948, the reason for this was that in the year 1884, the International Meridian Conference, aimed at bringing uniformity in all time zones of the world in Washington, was decided that India would have two time zones. Therefore, Kolkata's time zone has become popular as another valid time zone. Significantly, the time of Mumbai was also measured separately till 1955, although it has not been officially implemented. There is a clear reason for the need for more than one time zone in our country with a wide geographical location that in many parts of the country, the sun rises first and sets in front of other parts. In the northeast, morning and evening are early in comparison to the rest of the country, due to which the people working in the offices opening in accordance with a specific timetable have to face the problem and in the operation of aircraft flights etc. There is also discomfort. How practical is the demand for multiple time zones? In the eastern part of the country, the sunrise gets at about 4 in the morning (in Arunachal Pradesh), but the time to leave the office in the rest of India is at 10 in the morning, i.e. a person reaches the office in Delhi while the north-eastern states The person reaches the office after a lot of time goes through. In this way, he is not only returning from work but also tired when going. In the local time of the eastern-western end due to such a difference, human labor and billions of units of electricity are lost during the year. The loss of human labor certainly disrupts the development of these states. It is certain that proper management of human labor can be saved and large quantities of electricity can be saved from the system of different standard time. According to another solution, instead of making different standard times, doing work hours in the northeast states one or two hours before can also be a practical and effective solution to this problem. In different countries, time is determined not only through strict rules but also according to the convenience of the people. Globally, the highest time zone in the world, in France, there are 12 time zones, then there are 9 time zones in the US. There are 11 time zones in Russia. Due to the vastness of the icy country Antarctica there are 10 time zones. Britain also uses 9 time zones. There are only 8 time zones in Australia. In one part of this here, when 5 in the morning, at the same time, the second part is at 11 o'clock in the morning. Small country Denmark is also divided into 5 time zones. The same image in the mind of a common Indian towards time zones is that it is a natural process which can not be changed and the damage caused by it will have to bear in every situation, while this is not so. Now the National Physics Laboratory has also put forward the proposal to create separate time zones. If the proper management of human labor and large quantities of electricity can be saved from the system of different standard time then there is a need to be considered in this regard.